← Richie Dawson-Smith: Flying the flag for England. Mink van der Weerden: More than just penalty corners. Oranje Zwart were crowned Dutch Champions for only the second time in their history just last weekend. They won their two playoff games against HC Rotterdam to reach the final stage where again, over two games, they saw off the challenge of HC Bloemendaal. A constant feature in the playoffs, and indeed the whole season was the importance of the goals scored by Mink van der Weerden. Van Der Weerden chipped in with 36 league goals in 22 games and then five more in four games across the playoffs. It is fair to say his goalscoring ability has been central to his team winning the title for the first time since 2005. It is something of a story of redemption, too. Back in that 2005 campaign, Van Der Weerden, aged just 17 was a peripheral figure at OZ, yet to establish himself fully in the team. Indeed the future international star was one of the hordes of fans waiting to welcome their triumphant team back to the club for a victory party that glorious day. Now, nine years on, he is the returning hero, firing his team to glory. 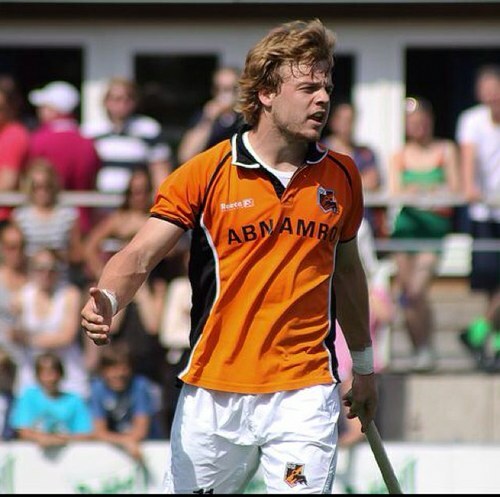 Of course Van Der Weerden’s penalty corner ability and goal return this season is no surprise to the hockey world. In the 2012 London Olympics he announced himself as a major threat in the world game as he picked up a silver medal and finished as the competition’s top scorer with eight goals. Inevitably, a Dutch player scoring from penalty corners drew immediate comparisons with the great Taeke Taekema. “I can only be flattered to be compared to Taekema. If you look at the number of games he’s played and the goals he’s scored it’s incredible. I don’t know if I’ll ever get to that level, I’ve only played about 50 games in four years for Holland, so I might not make his appearances but I can still dream of achieving what he has.” said the OZ No11 when the comparison was put to him. His improvement has been striking with his physical strength, pace down the flanks and ability to get up and down the pitch proving to be great assets in Oranje Zwart’s attacking style. Indeed one of his goals in the Dutch playoffs came from a driving run in from the right and a splendid reverse stick shot, showing he is far more than just a one trick pony. Perhaps if the Dutch penalty corner star can supply the goals to get his side over the line people will start to think of him as a great in his own right instead of comparing him to the legendary Taeke Taekema. He will certainly have earned his moment in the spotlight. The Top of the D would like to thank Mink van der Weerden for his time and patience in conducting this interview. This entry was posted in Euro Hockey League, Features. Bookmark the permalink. 1 Response to Mink van der Weerden: More than just penalty corners.